for wire or cable installation. 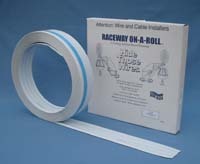 3 sizes: 1/2", 1", 1-1/2"
is the exclusive manufacturer of WIRE HIDER and RACEWAY ON-A-ROLL products. Please call (908) 872-2536 for free samples and a listing of national distributors.